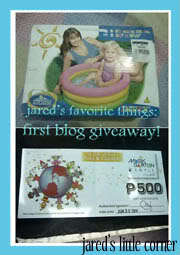 Two lucky followers of Jared's Little Corner will win either a P500 Musikgarten gift certificate or an intex inflatable pool (dimension: 24" x 81/2")! It's really hot this summer so I'd love to win the pool for my daughter. Winning it would definitely make her summer an awesome one! This giveaway runs until May 15th and is open to Philippine residents only. Winners drawn via random.org shall be announced on May 17. An email notification will be sent and the winner has 48 hours to respond. Otherwise, a new winner will drawn.